James Grant, Head of Security for Casino San Pablo visits Richmond Rotary to talk about what does and does not go on at an urban casino. Mr. Grant says he is looking forward to the question and answer period. President Elect Liliane Koziol filled in for Prez Jim Young and welcomed the club on a beautiful day. Josh Genser led us all in the Pledge, and Stoney offered an invocation for freedom, justice and peace on Earth, in special memory of our esteemed long-time member John Nicol. Bob Romero visited us from the Walnut Creek lunch club, where he is their President-elect. Jon Lawlis was with his lovely wife, Darlene. Hank Covell let the group know that although Henry Kelman has been having a very hard time of it, that he is starting to feel somewhat better. Liliane let us know that the BARSHEEP St. Patty’s day event was a great success and everyone had a wonderful time. Our club was particularly well represented! Pam Jones will again be leading Richmond Rotary in the Bocce Ball District Tournament this June 8th. Talk to Pam about participating in what should be a fun time. Mark Howe said the Peace Garden event was very productive and that we moved 20 tons of material. Mission accomplished! Henry Moe’s Salesian Interact kids baked a great meal for the volunteers at the first night of the new RotoCare Clinic. Our Guest Speaker Alan Blavins celebrated his 69th birthday and alluded to the obligatory numerical innuendo. He dined well at a fancy San Francisco restaurant to celebrate the event. Your pinch-hitting scribe Josh Surowitz turned 39 on Sunday, and spent a lovely day with his family, and also had a great Passover seder with extended family in Vacaville. Dan Sanders was very sad that their wonderful dog passed away several weeks prior, whom had brought “boundless happiness and love to all humans”, especially Dan and his wife. Alan Baer was happy to be looking forward to a veritable smorgasbord of food. Michelle Itagaki is happy she can now walk without a cane! Bill Koziol had a very happy and meaningful train trip to Reno with his Dad, who undergoes a major procedure this week. Erle Brown was happy because Dr. Dan Sanders’ office was able to send an emergency replacement part to Mexico, so Erle could fix his glasses and see! David Brown was happy to hear there are Jews in Vacaville (see above). Rafael Madrigal had a great trip to Cancun with his special gal and was glad to be let back into the USA! Jon Lawlis was happy to say it was great to see Cliff Dochterman speak. Ralph Hill was happy to be seated between two lovely ladies! Tom Waller was happy because he is helping with the important “Every 15 Minutes” drunk driving safety program for high school students. Alaska’s Department of Fish and Game is advising hikers, hunters, and fishermen to take extra precautions and be observant. They advise that outdoor enthusiasts wear bells on their clothing and carry pepper spray. They also recommend watching out for fresh signs of bear activity, and learning the difference between black bear and grizzly bear dung: Black bear dung is smaller and contains lots of berries and squirrel fur. Grizzly bear dung has little bells in it and smells like pepper spray. Our Richmond Rotary Club has had some adventurers over the years, but none seem to be on a level with Alan Blavins, who regaled us with his images and commentary about his most recent expedition – to Suriname. Alan started taking these trips with his son, 20 years old at the time, after watching “River Monsters” on National Geographic. Though Suriname is in South America, it is not so easy to get to. So much so that they first had to fly to Amsterdam. Apparently, though Suriname boasts the most pristine jungle in the world. It also has more casinos than Las Vegas, in its capital. But clanking slot machines are not what brought the Blavins men to Suriname. After a dangerous ride down a river a million miles from anywhere, they first caught Piranha for bait, including 5 and 8 pounders. They then proceeded to catch 20 enormous and beautiful fish in less than an hour. The reason being that that part of the river had never been fished! Words cannot describe how these creatures appeared. A hundred degrees plus, right on the equator, they slept on hammocks on a tarantula-infested porch. 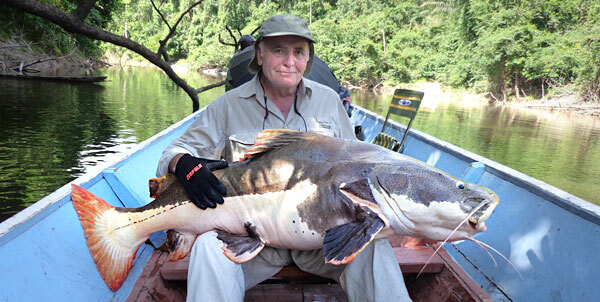 They also caught a 120-pound cat fish! Not satisfied with the amount of fishing they had done, the Blavins men hopped back on a plane, but this time to the UK, where Alan’s son has a fishery. Using an incredible technique with a 6-meter rod without reel, they managed to catch a 50- carp. Not a bad fish story!